Day 117 Dronningmolle Strand, North Zealand. A day of essential chores today. Not the most exciting way to spend the day, but it had to be done. We didn’t want to take a van load of dirty washing to Iceland with us, and we needed to start planning for the next stage of our trip. 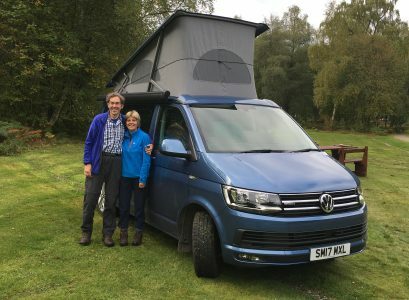 We are the only VW California on this site, and I have the sense that everyone is rather intrigued as to how the two of us are squeezing into such a small beast. We certainly got a few looks this morning from our neighbours when they spotted the Oscar’s windscreen cover peering at them. It would be a lie to say that sometimes I don’t get ‘Big White’ envy – especially when it’s cold or raining and I need a pee, but in general, I am finding the confined space OK, particularly now that the weather is better, and we can sit outside. The limbo dancing round the table at supper time at the beginning of the year has now faded into a distant memory, since we have largely eaten outside for the past month or so. However, looking at the guide books on Iceland today, I was struck by the number of campsite descriptions that talked of pitches being sited behind hedges to shelter from the prevailing wind. I think we might be in for a bit of a shock when we get there – today the temperature was in the high 20s in Denmark, but only six degrees in Reykjavik. For a bit of an outing later in the day, we ventured along the coast a few miles to a pleasant harbour town of Hornbaek. It had a thriving marina, and beautiful sand dunes leading down to a long sandy beach. It looked spectacular as the sun was starting to set behind the dunes. We grabbed a quick take-away pizza and headed back to our campsite. Just as we arrived back at Dronningmolle, the sun put in it’s final appearance, and gave us a stunning sunset. It was one minute to nine. We reminded ourselves that at the beginning of our trip in Scotland, it was almost dark by 4.30, and travelling down through Spain and Portugal, even in the far south, it was dark by six. How lovely it is to have these longer light evenings. By mid summer, we hope to be in Norway, the land of the midnight sun, where it barely gets dark at all. But all these things are to come. For now I will leave you with a few photos of tonight’s gorgeous sunset. Previous Post Day 116 Copenhagen to Dronningmolle Strand, North Zealand. Next Post Day 118 Dronningmolle Strand, North Zealand to Faaborg, Funan.